A brief history is a bit of a misnomer, because gongs have been around since the Bronze Age, about 5,000 years. The gong is believed to be one of the oldest type percussion instruments man still plays today. Gong music has not seen many changes in that time, until now. 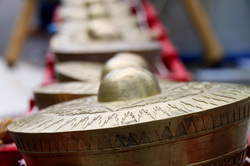 Throughout history, and around the world, gongs have been used in traditional entertainment, as well as in cultural and religious rituals and ceremonies. Gongs are still today used in much of Asia. The gong is a percussion instrument (one that must be struck or hit) usually made of brass. Symphony orchestras and rock bands use them for the effect of a loud crashing sound, like the song Bohemian Rhapsody, by Queen. More recently, some may have heard a gong on the irreverent late 70s talent contest "The Gong Show". If the contestant was not very entertaining, one of the judges would hit the gong and the contestant was unceremoniously dismissed. Many people today use gongs for musical relaxation and deep meditation. For interpretive music, the gong is played with various techniques and tools which bring out the deep resonance and harmonics of the metals. After an interpretive gong concert people often describe the sounds, and experience of the gong, as if they have been traveling in space, or the ocean.